Vol 4 | Issue 3 | Sept-Dec 2018 | page: 20-25 | Rohan R Memon, Neel M Bhavsar, Rameez A Musa, Pankaj R Patel. Author: Rohan R Memon , Neel M Bhavsar , Rameez A Musa , Pankaj R Patel . Department of Orthopaedics, Sheth VS General Hospital, Ahmedabad, Gujarat, India. Sheth VS General Hospital, Ahmedabad, Gujarat, India. Introduction: Subtrochanteric Fractures Of Femur accounts for 10-34% of all hip fractures.Several Methods of treatment of this Fractures have been reported like DHS( Dynamic hip screw),Angled blade Plate,Proximal Femur Locking Plate and Intramedullary devices. Currently Intramedullary Devices like Proximal Femur Nail are used by many giving Satisfactory results in subtrochanteric femur fractures. In such situation as Suggested by Richardu et. al. slight medial entry leads to valgus alignment which is desired along with the anatomical reduction while nailing subtrochanteric fractures. In the study conducted by perez et al. Suggested that slight more medial entry also protected abductors and caused no damage. Materials and methodology: • Permission from ethical committee was taken • Patient data is collected from OOT register VSGH from 2014-2016 • All the patients of subtrochanteric femur fractures treated with long proximal femur nail through medial entry will be called for follow up and data is collected as per the performa • Patients were followed up at 2 ,4 ,6 weeks and than monthly with clinical and radiographic assessment until fracture union.fracture union was considered when bridging callus was visible on 3 of 4 cortices on anteroposterior and lateral radiograph • Functional assessment will be done using Harris Hip Score. Conclusion: This study was conducted to analyze the results of Subtrochanteric fractures treated with this Proximal Femoral Nail through medial entry both radiologically and functionally. In our series of 30 cases of Subtrochanteric fractures treated with Proximal Femoral Nail, 24 patients had Excellent to good outcome at their final follow up. Poor outcome was seen in 02 patients. 2 of these patients had poor reduction intraoperatively. The mean Harris Hip score at their final follow up was 80.76 which is comparable to international publications in the literature. On follow up radiological examination at 6months 10 patients had 2-4 degrees of valgus angulation,16 patients had 4-6 degrees of valgus angualtion and 4 patients had 6-8 degrees of valgus angulation with no varus collapse. From this sample study, we conclude that Proximal Femoral Nail through medial entry is a good method for the treatment of Subtrochanteric fractures of femur provided optimal reduction of the fracture and good positioning of the nail and screws are achieved. 1. Tencer AF, Johnson KD, Johnston DW, Gill K. A biomechanical comparison of various methods of stabilization of subtrochanteric fractures of the femur. J Orthop Res 1984;2:297-305. 2. Beingessner DM, Scolaro JA, Orec RJ, Nork SE, Barei DP. Open reduction and intramedullary stabilisation of subtrochanteric femur fractures: A retrospective study of 56 cases. Injury 2013;44:1910-5. 3. Herscovici D Jr., Pistel WL, Sanders RW. Evaluation and treatment of high subtrochanteric femur fractures. Am J Orthop (Belle Mead NJ) 2000;29:27-33. 4. Borens O, Wettstein M, Kombot C, Chevalley F, Mouhsine E, Garofalo R, et al. Long gamma nail in the treatment of subtrochanteric fractures. Arch Orthop Trauma Surg 2004;124:4437. 5. Connelly CL, Archdeacon MT. The lateral decubitus approach for complex proximal femur fractures: Anatomic reduction and locking plate neutralization: A technical trick. J Orthop Trauma 2012;26:252-7. 6. Saarenpää I, Heikkinen T, Jalovaara P. Treatment of subtrochanteric fractures. A comparison of the gamma nail and the dynamic hip screw: Short-term outcome in 58 patients. Int Orthop 2007;31:6570. 7. Richard SY, Derek JD, Frank AL. Reducing subtrochanteric femur fractures: Tips and Tricks, Do’s and Don’ts. J Orthop Trauma 2015;29:S28-33. 8. Johnson KD, Tencer AF, Sherman MC. Biomechanical factors affecting fracture stability and femoral bursting in closed intramedullary nailing of femoral shaft fractures, with illustrative case presentations. J Orthop Trauma 1987;1:1-1. 9. Kraemer WJ, Hearn TC, Powell JN, Mahomed N. Fixation of segmental sub- trochanteric fractures. A biomechanical study. Clin Orthop Relat Res 1996;332:71-9. 10. Wang J, Ma XL, Ma JX, Xing D, Yang Y, Zhu SW, et al. Biomechanical analysis of four types of internal fixation in subtrochanteric fracture models. Orthop Surg 2014;6:128-36. 11. Brumback RJ, Toal TR Jr. Murphy-Zane MS, Novak VP, Belkoff SM. Immediate weight-bearing after treatment of a comminuted fracture of the femoral shaft with a statically locked intramedullary nail. J Bone Joint Surg Am 1999;81:1538-44. 12. Benirschke SK, Melder I, Henley MB, Routt ML, Smith DG, Chapman JR, et al. Closed interlocking nailing of femoral shaft fractures: Assessment of technical complications and functional outcomes by comparison of a prospective database with retrospective review. J Orthop Trauma 1993;7:118-22. 13. Astion DJ, Wilber JH, Scoles PV. Avascular necrosis of the capital femoral epiphysis after intramedullary nailing for a fracture of the femoral shaft. A case report. J Bone Joint Surg Am 1995;77:1092-4. 14. Orler R, Hersche O, Helfet DL, et al. Die avaskula re Hu ftkopfnekrosealsschwerwiegende Komplikationnach Femurmarknagelungbei Kindern und Jugendlichen. Unfallchirurg 1998;101:495-99. 15. Harris WH. Traumatic arthritis of the hip after dislocation and acetabular fractures: Treatment by mold arthroplasty. An end-result study using a new method of result evaluation. J Bone Joint Surg Am 1969;51:737-55. 16. Dodenhoff RM, Dainton JN, Hutchins PM. Proximal thigh pain after femoral nailing. Causes and treatment. J Bone Joint Surg Br 1997;79:738-41. 17. Bednar DA, Pervez A. Intramedullary nailing of femoral shaft fractures: Re-operation and return to work. J Can Surg 1993;36:4646. 18. Ostrum RF, Marcantonio A, Marburger R. A critical analysis of the eccentric starting point for trochanteric intramedullary femoral nailing. J Orthop Trauma 2005;19:681-6. 19. Neher C, Ostrum RF. Treatment of subtrochanteric femur fractures using a submuscular fixed low-angle plate. Am J Orthop (Belle Mead NJ) 2003;32:29-33. 20. Wang J, Ma XL, Ma JX, Xing D, Yang Y, Zhu SW, et al. Biomechanical analysis of four types of internal fixation in subtrochanteric fracture models. Orthop Surg 2014;6:128-36. 21. Streubel PN, Wong AH, Ricci WM, Gardner MJ. Is there a standard trochanteric entry site for nailing of subtrochanteric femur fractures? J Orthop Trauma 2011;25:202-7. 22. Ansari Moein C, ten Duis HJ, Oey L, de Kort G, van der Meulen W, Vermeulen K, et al. Functional outcome after antegrade femoral nailing: A comparison of trochanteric fossa versus tip of greater trochanter entry point. J Orthop Trauma 2011;25:196-201. 23. Starr AJ, Hay MT, Reinert CM, Borer DS, Christensen KC. Cephalomedullary nails in the treatment of high-energy proximal femur fractures in young patients: A prospective, randomized comparison of trochanteric versus piriformis fossa entry portal. J Orthop Trauma 2006;20:240-6. 24. French BG, Tornetta P 3rd. Use of an interlocked cephalomedullary nail for subtrochanteric fracture stabilization. Clin Orthop Relat Res 1998;348:95-100. 25. Wiss DA, Brien WW. Subtrochanteric fractures of the femur. Results of treatment by interlocking nailing. Clin Orthop Relat Res 1992;283:231-6. 26. Ostrum RF, Marcantonio A, Marburger R. A critical analysis of the eccentric starting point for trochanteric intramedullary femoral nailing. J Orthop Trauma 2005;19:681-6. 27. Streubel PN, Wong AH, Ricci WM, Gardner MJ. Is there a standard trochanteric entry site for nailing of subtrochanteric femur fractures? J Orthop Trauma 2011;25:202-7. 28. Prasarn ML, Cattaneo MD, Achor T, Ahn J, Klinger CE, Helfet DL, et al. The effect of entry point on malalignment and iatrogenic fracture with the synthes lateral entry femoral nail. J Orthop Trauma 2010;24:224-9. How to Cite this article: Memon R R, Bhavsar N M, Musa R A, Patel P R. Outcomes of Proximal Femoral Nail in Subtrochanteric Femur Fractures Through Medial Entry. 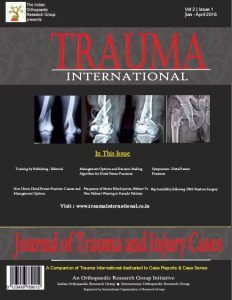 Trauma International Sep – Dec 2018;4(3):20-25.